There are really three major obstacles for electric vehicles from this writers perspective. All of them are difficult to overcome and it will take time. The three obstacles are Resistance to change, Installing Public Electric Charging Stations, and time to recharge batteries. We will explore each of these in more detail. However many people would argue that the lack of electric charging stations is a big impediment. With only 10,000 electric vehicles in Quebec and 5000 in Ontario, there is not much incentive to install charging stations. Consumers are pretty happy with their gasoline and diesel powered cars. They like the features, the flexibility and the ideal they can fill up anywhere and pretty much at any time. It only takes a few minutes as well to fill up the gas tank. The only negative is the cost of rising gasoline prices. At the time of writing this post is pretty flat and not hurting people in the wallet. There are simply not enough charging stations around. Although more are being installed every week, the numbers do not begin to approach the availability of gasoline stations. There also at the present time little financial incentive for dealers to install charging stations. Time will solve this problem, but right now it is a huge impediment. Another big negative is the time to recharge the batteries. A consumer will need at least a few hours or even overnight, depending on the charging station capacity. Compared to five minutes this really just does not work. 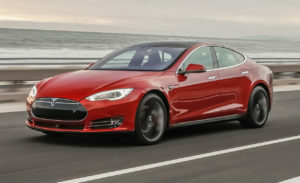 Tesla has tried to deal with this issue by providing a battery swapping service which cuts down the time significantly. It will be many years before this service is wide spread. 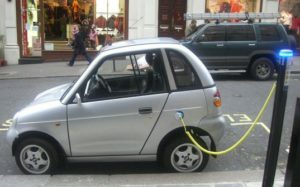 For more interesting posts about electric vehicles, click here. We are trying to get more information about this topic. However it appears that there are now 20 electric car charging stations that have been set up along the 401 between Windsor and the Québec border. Apparently 20 of the fastest charging stations have been installed every 50 to 98 kilometers along the highway for electric car owners to stop and charge their cars. At the current time the use of the chargers and the electricity is free to drivers. It is provided by the host of the location. 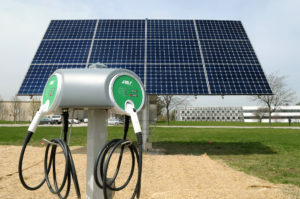 These sites have been set up by Sun Country Highway to promote green products and particular the all electric vehicles that are gradually becoming more popular. For example a Comfort Inn along the highway is one of the sponsors that has a charging stating installed on it’s property. It is providing the electricity free of charge to customers. It takes about 3.5 hours for a full charge. And bout one hour to top up the batteries on these electric vehicles using a level 2 charger. Level 3 chargers are under development. They will significantly drop the charging time down to 30 minutes to recharge a battery. This is really great news for the electric car industry. This is one of the most Significant issues when it comes for consumers to purchase electric cars. They want to know what will happen when the batteries run out. Where they can recharge the battery of the car. In the United States, they expect that sales of hybrid and electric vehicles will reach 100,000 in 2013 compared to 53,000 sales in 2013. We have also heard that California is making it possible to drive an electric car from Mexico to the northern California Border. They are installing charging stations all along the major highways to make this possible. The main stumbling blocks to significant increases in purchases for all electric vehicles is the higher price. Also the time it takes to recharge the batteries. Availability of locations to charge the batteries is becoming less of a problem. More and more locations provide charging points for electric car owners. However they are becoming more popular as sales indicate. Even Justin Bieber has an electric hybrid! California is setting aside parking spots that are reserved for electric vehicles in much the same way that spots are reserved for handicap spots and pregnant women. Unfortunately people with regular cars are not respecting these parking spot. They are using them to park in with regular gasoline powered cars. This can be a huge problem if you are driving an electric car. Especially if you need to recharge it before continuing your trip. Imagine, your battery is almost dead. Someone is parked in an electric car charging spot and is not charging his or her car! All you want is to recharge and get going. More and more people are urging city counsels to pass laws that ticket non electric car drivers when they park in these spots. They feel that enough time has passed and that the grace period is over. Ticket these cars in the same way that a car parked in a handicap zone would be ticked. The meter maids and the people who enforce bylaws can implement these parking rules. Make more electric car parking spots available. They should also be made available in states that are pushing for electric cars to help deal with pollution. This is going to cause more conflict with regular car drivers. Since in cities were parking is already at a premium, they will be reserving spots for charging electric cars. City counsels who are in favor of promoting green energy approaches are going to have to pass parking by laws. They need to support these kinds of initiatives. This will take some time before laws will be passed. Since there are just not enough electric vehicles on the road. Eventually there will be. But this may take a few years. in the mean time they will just have to deal with the frustration of few spots to charge their cars being available and people parking in them when they should not be. Most electric car drivers want police to charge drivers who park in these electric car charging spots. We anticipate that there will even be arguments and some form of road rage about this before it settles down and people accept the changing approach to cars. We are about to enter a significant change in driving and parking habits. As with all major changes in our society, some people embrace the changes and some fight change. Which kind are you? Treat these spots in the same manner as handicap spots in terms of policing, bylaws and ticketing. This is the only way that some people will get the message and stop using the spots for non electric vehicle parking. 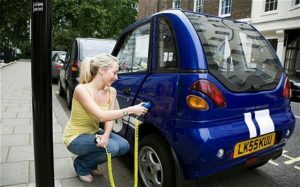 Apartment dwellers are looking for electrical outlets to plug-in their electrical vehicles to recharge them over night. Electric vehicles create issues for apartment managers and superintendents. Governments are pushing better utilization of our resources, specifically to cut down on our dependence on foreign oil and yet this is creating many issues for individuals who want to support the initiative and are coming face to face with the reality of where do they charge up their vehicle. If you live in a single family home or even a townhouse were you have your own electrical meter, there is no issue other than the basic economics of recharging your vehicle. We urge you to do your own math as well to confirm your potential savings when you purchase an electric vehicle. Life is never Simple and Straight Forward. For apartment dwellers it is not so simple. Most people will park in a garage or even surface parking were there is no access to an electric plug of sufficient amperage. In those few places were there are plugs, many owners are objecting to paying for the increase in electricity that is being used. Some property managers have removed electrical outlets so they cannot be used to charge electric cars. In addition, the existing electrical system in older buildings may not be up to the standard and capacity needed to support more than a few cars plugged in to recharge. Expensive upgrades may be required and the owner is left wondering who is going to pay for this expense and how will he recover this expense through the rent or other fee’s. At the very least, there may be only one electrical outlet in the garage and not close to the car owners requested parking spot. In some colder climates, electrical outlets are provided for car warmers and engine heaters. they are intended for this purpose and not for recharging electric cars. One electric car owner has volunteered to pay for his share of the electricity based on the manufacturers anticipated usage and local rates for electricity. He even volunteered to double what he should pay from a theoretical perspective. The apartment building owner is worried that even though this car owner is willing to pay , he may find himself committed to expensive electrical system upgrades or risk the wrath of the other apartment dwellers when the breakers let go and everyone is in the dark. In many jurisdictions, the rent is controlled so increasing the rent is not a solution. This is still very early in the product life cycle for electric vehicles. The issues and problems are just now being realized. Many people with good intentions will purchase electric vehicles and then be faced with where do they recharge their vehicle. Once they have committed their money they will be motivated to solve these minor problems. All it will take is a competitive market for apartment units and an apartment owner advertising that they have parking stalls available for electric cars to get the ball rolling. It will become a competitive issue at some point to capture some of the best apartment owners who pay their rent on time and cause few problems. I am thinking that if you can afford to purchase an electric car, you are making pretty good money and will appreciate a higher quality of apartment. Many other industries started out this way and gradually over time as the penetration of the product grew, more and more support facilities were made available. If you would like to leave a detailed comment about electric vehicle recharging challenges, please leave one at the bottom of this post. You may agree with our opinion or perhaps not and have a different perspective on it. We would like to hear your opinions. Well written comments will be accepted and we will even approve a link back to your web site for well written on subject comments.